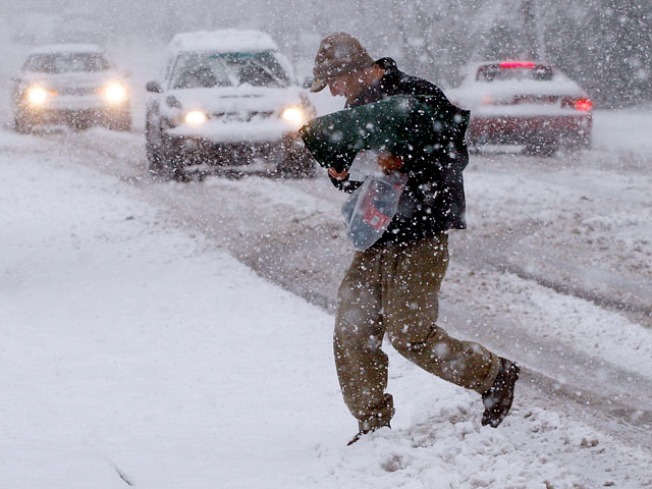 A pizza delivery man crosses a street in the falling snow to make a delivery in Asheville, North Carolina. Over six inches of new snow has fallen in the past 24 hours in Western North Carolina. 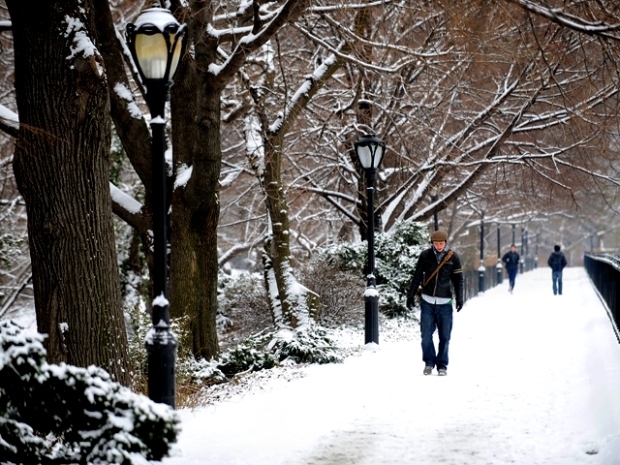 "Super Saturday" ended up as Snowy Saturday for much of the region. The last Saturday of shopping before Christmas, usually one of the busiest days of the year for retailers, was snowed out on most of the East Coast by blizzard-like conditions that stretched from the Carolinas to New England. Many retailers were open but crowds were sparse on a day stores count on for a successful season. Treacherous roads and near whiteout conditions kept many shoppers away from shopping malls and other stores. For retailers hoping for a better holiday season than last year's dismal sales, the bad weather was especially painful. New York City saw more than 11inches of snow and gusts of wind up to 30 mph -- and parts of Long Island and New Jersey had it much worse than that. Compounding problems were snow-covered roads and spotty public transportation. Shopping malls were especially affected by bad roads. Some big stores opened on time, but others remained dark after their posted opening hours. The holiday shopping season so far has been mildly encouraging for retailers who have suffered due to high unemployment and the weak economy that have made consumers reluctant to spend. Most reports put spending slightly above last year's levels. It's still unclear how the storm will affect sales later in the week and whether consumers who stayed home Saturday would shift their shopping to Sunday. Super Saturday usually accounts for $15 billion worth of sales nationwide, according to Scott Bernhardt of weather research firm Planalytics. The storm's current track means it will likely impact about a quarter of the U.S. population. Those that do shop will likely make their trips short, he said. "They are going to dash in and dash out. They aren't going to do any impulse buying," he said. Retailers with an especially high concentration of stores in the affected region include Bon-Ton stores, DSW Shoe Warehouse and Kohl's Inc. The effect on retailers is likely to be less than it would if the snow hit even later in the season, said Michael Niemira, chief economist of the International Council of Shopping Centers. They still have several days to make up the sales. And while the storm hit the heavily populated East Coast, most of the rest of the nation was unaffected by bad weather. The storm didn't lead Niemira to change his estimate that November and December spending would rise 1 percent from last year. Online shopping also could get a boost as consumers buy from home rather than brave the bad weather. "People may just sit at home and shop," said Hana Ben-Shabat, a partner in the retail practice at A.T. Kearney, a global management consultant. In New York, shoppers were trying to wrap up ahead of the storm. At Manhattan Mall, a few blocks away from Macy's flagship store in New York, stores like J.C. Penney were still bustling at midday, when snow hadn't yet materialized. But even shoppers who took the train in to the city were wary. Natalie McCann, of Edison, N.J., said she would probably cut short her annual trip into the city on the last Saturday because of the building storm. But it wasn't the snow that was keeping her from spending big on gifts. "I'm just not that enthusiastic this year," said McCann, 47, who says she's cutting her spending significantly to about $750.